The huge waterlogging at the Kochi airport -- the busiest in Kearala -- had left the state with only two operational civil airports, at Thiruvananthapuram and Calicut. INS Garuda is one of the oldest operating air stations of the Navy built on British-era aviation facilities. INS Garuda is a naval air training centre and an operational air base located in Kerala's Kochi. 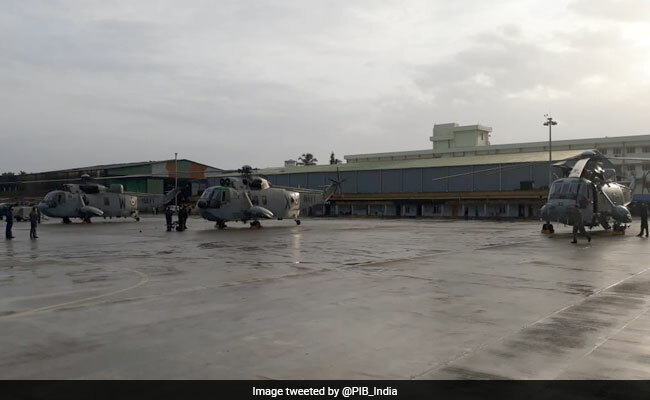 The Naval air base in Kochi is almost ready for commercial flights to begin operation from tomorrow in flood-ravaged Kerala. Naval Air Station INS Garuda received clearance to operate passenger planes. The decision came soon after the visit of Prime Minister Narendra Modi, who flew into Kochi on Saturday for an aerial review of the situation in the state. Today, the spokesperson of the Navy tweeted to say that all arrangements are in place: "#OpMadad #KeralaFloods2018 #KeralaFloodRelief Naval Air Station INS Garuda at Kochi cleared for operating civil flights commencing tomorrow morning @DefenceMinIndia @SpokespersonMoD @nsitharaman @CMOKerala. The airport in Kochi, the state's busiest, has been shut since last Tuesday, when the runway got flooded and the water entered certain facilities. Shocking visuals from the airport showed majestic planes standing forlorn amid a sea of dirty brown water. The authorities said the airport will be shut till August 26. The situation in Kochi had left the state with only two operational civil airports -- at Thiruvananthapuram and Calicut. Alliance Air, a subsidiary of the state-run Air India will be the first airline to begin operations from the naval airstrip. Civil aviation minister Suresh Prabhu said more airlines will join in as destinations, including Madurai, is added. Mr Prabhu earlier tweeted to say a joint team had checked the feasibility of using the Naval base. INS Garuda is one of the oldest operating air stations of the Navy built on British-era aviation facilities. A naval air training centre and an operational air base, it lies adjacent to the Southern Naval Command.